Welcome to the future. In the Android setting, our own world has seen great technological advancements—and yet, at the same time, it’s all too recognizable. The wealth gap between the “haves” and the “have nots” has deepened into an insurmountable abyss. Idealistic notions like personal privacy are a thing of the past. Bioroids and clones have achieved immense popularity as “labor solutions,” pushing humans around the world out of jobs. Into this dynamic world, a central conflict is introduced. On one side, the monolithic megacorporations that rule the world in all but name. They have the money, the manpower, and the assets to make anything possible. Even the stars are no longer a limit, as humankind has expanded to Earth’s moon and to Mars. For a corp, the pursuit of the bottom line is everything. These corps may seem unstoppable—but there are always those who are willing to take the fight to them. These cyber-criminals, known as runners, use custom-built rigs and homebrewed programs to hack into the corps’ most well-protected servers in search of secret agendas and valuable data. Some run for money, some to cause chaos, and some just for the thrill of testing themselves and their creations against the best. The conflict between corp and runner lies at the heart of Android: Netrunner The Card Game—a Living Card Game® of cyber-crime for two players, set in a dystopian, cyberpunk future. 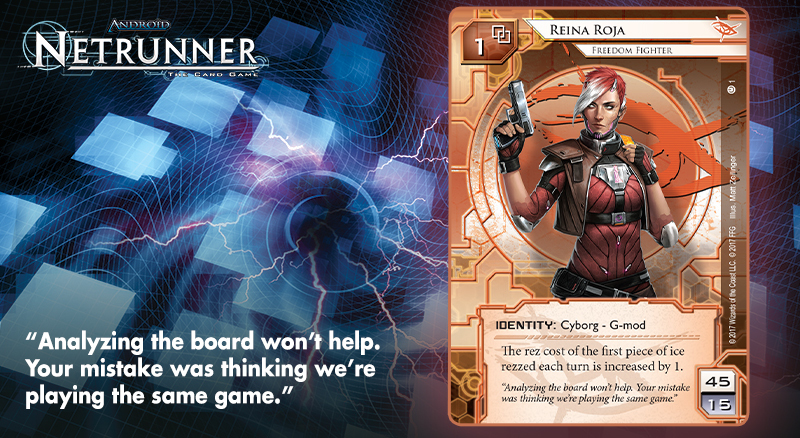 Now, you have your best chance yet to get into the game—the Android: Netrunner Revised Core Set is now available at your local retailer! 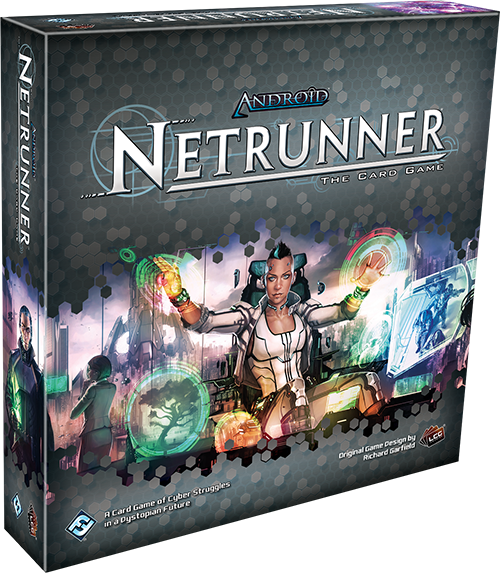 The heart of every game of Android: Netrunner is the run—when the player controlling the runner attempts to break past the corp’s defenses and infiltrate their most vulnerable servers. For veteran players of Android: Netrunner, the Revised Core Set and the effects of rotation mark a return to basics. Corp and runner will find themselves engaged in a game of cat and mouse, in a contest where the hunter can become the hunted in the time it takes to jack into the net. When you’re playing the corp during a game, your goal is to advance your secret agendas, which are hidden throughout your deck. To score one of these agendas, you’ll need to place it into a remote server and invest the time and credits to advance it… and your agendas can be stolen by the runner at any point along the way. Of course, to actually crack your defenses, the runner will need to bypass the ice (intrusion countermeasure electronics) that you’ve installed to protect your servers. From the runner’s perspective, the corp’s agendas and assets begin the game shrouded in mystery. Every card that the corp installs comes into play facedown—meaning you never know exactly what you’re going to encounter. A piece of ice that you encounter could be as innocuous as a solid wall that simply ends your run. Or, you might run face-first into a piece of illicit “black ice,” that exposes your location to the corp, fries your rig, or deals crushing and permanent brain damage. And when you finally reach the darkest, deepest roots of the server, you still won’t know exactly what you’re getting into until you flip those cards faceup. Your objective may be a valuable agenda, bringing you closer to winning the game, or it may be a deadly ambush. The mindgame that surges to life between corp and runner challenges both players to read the other’s intentions in a frantic, paranoid battle of wits. We explored the mechanics of making a run in much more detail in our first preview, and you get a closer look at that here! All corps have certain things in common, and runners have similar similarities. All corps are concerned with protecting their secrets and the bottom line, advancing their agendas at any cost. All runners want to steal agendas, breaking into corporate servers using their custom-built rigs and programs. That’s about where the similarities stop, however. 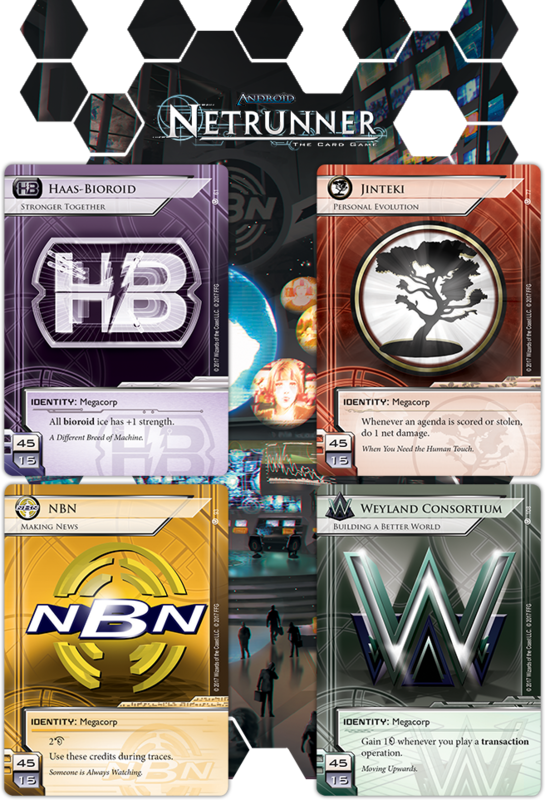 There are four different corporations that you can play as in Android: Netrunner, and we explored each of them in detail in our preview of the Corp factions. You may play as the efficient, bioroid-driven corporation of Haas-Bioroid, or devote yourself to the tradition-steeped cloning industries of Jinteki. NBN, the world’s premier news and media conglomerate, has eyes on nearly everyone, while the Weyland Consortium will achieve their lofty, shadowy goals no matter how many people are hurt—or killed—in the process. Each of the corps has access to unique pools of cards, and playing each corp feels very different from playing any other. Against these four megacorps, you’ll find the runners broken down into three primary factions, each with their own reasons for running. Anarchs are interested in sowing chaos and bringing the corps to their knees—perhaps they want the corps to answer for the crimes and injustices that they’ve perpetrated, or perhaps they just want to bring down the mighty. Criminals run for the same reason the corps pursue their own agendas… for money. And for the Shapers, there’s something a little harder to pin down: the thrill of creating a rig and testing it against the best, a love of experimentation, or just “because it’s there.” You can learn more about each of the three main runner factions in our preview. Finally, we took a closer look at how the Android universe itself has changed… and how it’s stayed the same. The Revised Core Set takes place five years past the events of the original Core Set, and while you’ll find some of your favorite characters returning, they may be a little more grizzled, a little more worldly and weary than before. With a wealth of stunning new Android artwork, new and old fans alike can find plenty to admire within the Revised Core Set. Whether you’re jacking into the net and starting your first run, or you’re a corporate executive who’s crushed dozens of foolish runners who tried to bring you down, you can enter the cyber-struggles of the near future with the Revised Core Set for Android: Netrunner. 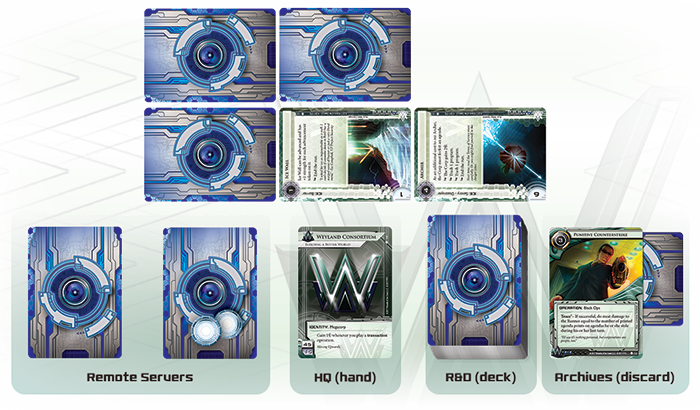 Pick up your copy of the Android: Netrunner Revised Core Set (ADN49) at your local retailer today!